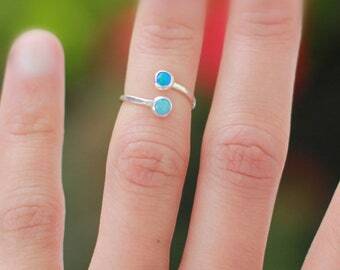 Such a fun and unique ring! 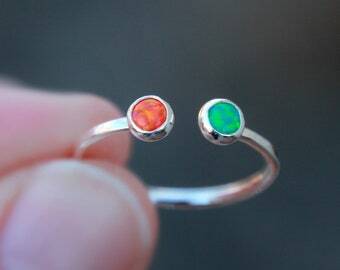 A great way to show off multiple stones without having to have a ton of bands on your finger. A perfect way to represent kids/grand kids, or just your favorite colors! Click the grey 'ZOOM' button on the last photo to enlarge the colors to get a better view. 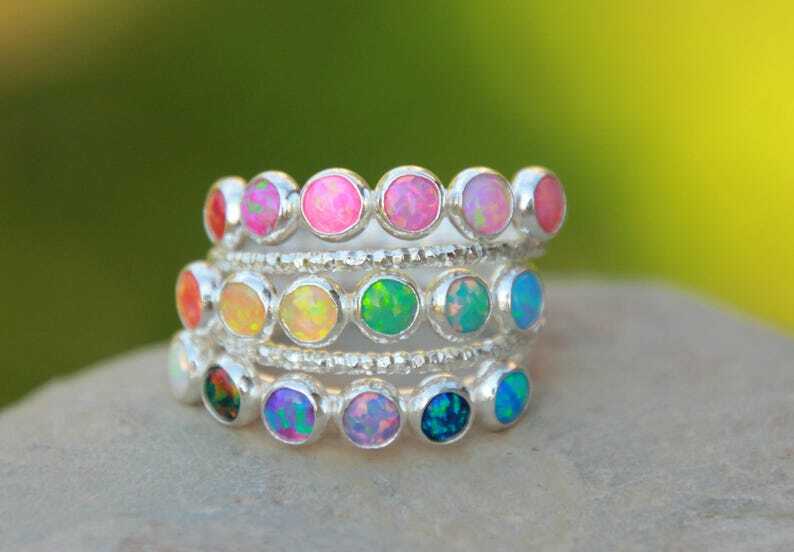 Your choice of how many opals you would like on your band and where you want them. Please take a look a some of the photos. Use the drop down box to select your number of stones. Also, please let me know how you would like them fused on the band. You can have them right next to each other if you only want 2 or 3, or if you fancy a bunch like in the photo I can fuse them so they go all the way around the band. 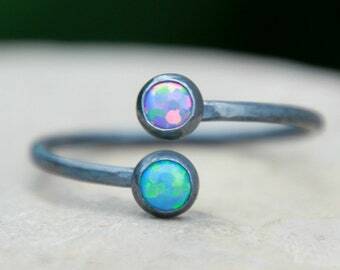 4mm opals in 25 delicious colors! These bright, beautiful opals are very fiery with a great sparkle! Since you have your choice of so many colors, these could also represent birth months. Each 1.7mm band is made using Argentium sterling silver. I hand forge each band, fuse them together, then fuse on the 4mm Argentium sterling silver bezel cup, then put them in my tumbler for a high shine, which also makes them stronger! Your choice of hammered or smooth band. 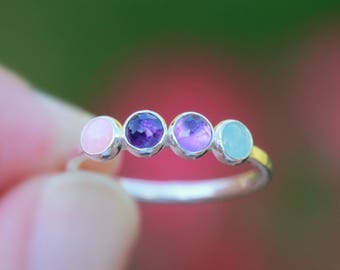 ~ALSO AVAILABLE IN 14K GOLD-FILLED, SEE 8TH PHOTO! IF YOU WOULD PREFER IT IN GOLD, PLEASE SEND ME A MESSAGE. 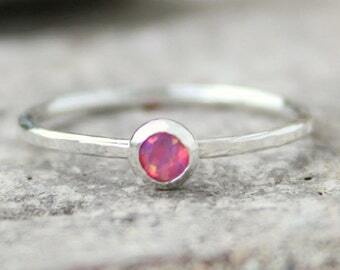 ~ALSO AVAILABLE WITH NATURAL GEMSTONES (SEE 9TH PHOTO) AND CZ BIRTHSTONE GEMSTONES. IF YOU WOULD PREFER A NATURAL GEMSTONE OR CZ, PLEASE MESSAGE ME! 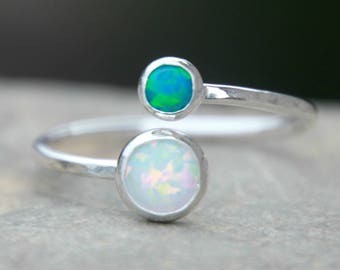 Please let me know the color of your opal(s) and where you would like them placed on your band in the 'notes to seller' box upon checkout and which finish, hammered or smooth. If not stated, I will place the stones where I think they would look best and I will also hammer the band. it's unexpectedly to big for my fingers but this is a really beautiful ring. 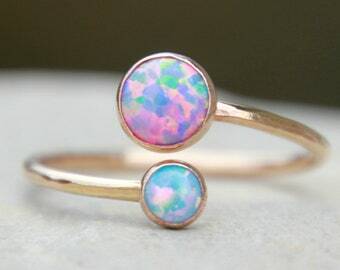 I've felt in love immediately, And now, of course, I want to have matching earrings and the other ring with other stone colors. 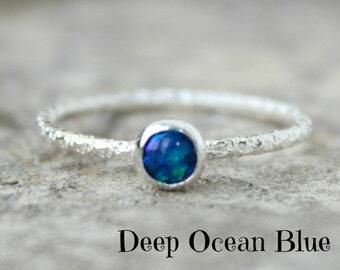 definitely one of the most beautiful rings I have. It's beautiful. My wife loves it.